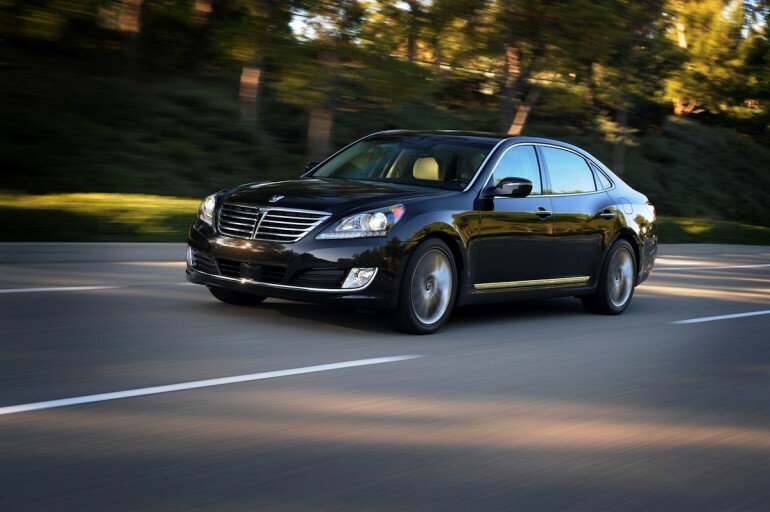 Hyundai calls its Equus sedan the “most shopped premium luxury sedan” in the U.S. market, and it’s easy to understand why. Compared to rivals like the BMW 7-Series, the Lexus LS, the Jaguar XJ and the Mercedes-Benz S-Class, it delivers much of the same luxury at a fraction of the price, and looks good doing it. Since the Equus’ U.S. launch in 2010, the biggest changes have been under the hood, where the Tau V-8 has grown in size from 4.6 to 5.0-liters, and the transmission has grown from six to eight gears to aid both performance and fuel economy. In other words, changes have been minimal – until now. The 2014 Hyundai Equus sports a revised front end look, which ties it back to the rest of the product line like never before. In the past, it was hard to tell that the Equus came from Hyundai, but now there’s somewhat a family resemblance to the Azera and Sonata sedans. Inside, the Equus gets a new instrument cluster, upgraded cabin materials and expanded rear seat control options, which may prove especially helpful in long-wheelbase models. Hyundai claims the Equus delivers more passenger room than the Lexus LS 460, which is just one more reason to add the car to your shopping list. Hyundai ups its safety ante in 2014 as well, making features like blind spot detection, adaptive cruise control, lane departure warning and cross-path detection standard. Opt for the range-topping Ultimate version, and you’ll also get things like a heads up display, a cornering camera and a multi-view camera system. Hyundai’s air suspension returns, in recalibrated form, as does the current car’s drivetrain. The Equus’ Tau V-8 makes 429 horsepower and 376 pound-feet of torque, which is enough to move the big car with some enthusiasm. Perhaps its a good thing then, that the “Sport” mode has been reworked for better handling, while the “Normal” mode gets improved ride comfort. Hyundai isn’t saying when the revised Equus sedan will hit U.S. dealers, nor is it releasing pricing information just yet. We’ll update you on both closer to the model’s launch.